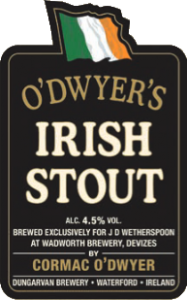 Cormac was delighted recently to be one of ten international brewers to be invited to the UK to brew for the Wetherspoon’s Real Ale Festival 2015, brewing up O’Dwyer’s Irish Stout at Wadworth’s Brewery in Wiltshire. 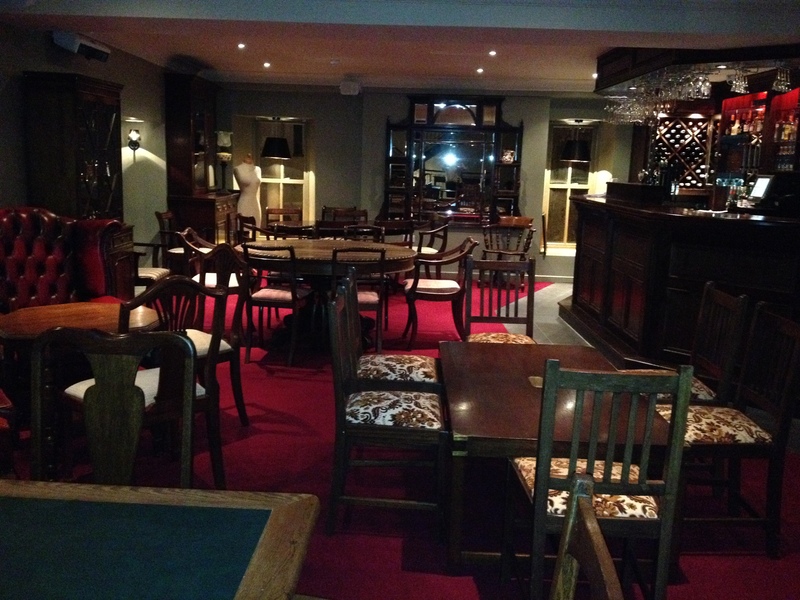 All the brews took place at the UK breweries on the 9th February 2015, with all the brewers meeting in London for the social side of things the following evening. 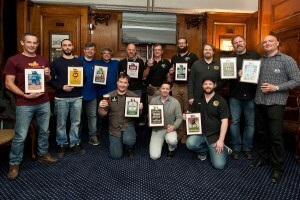 Cormac (front and centre) with the other international brewers. The beers are to be served alongside forty other UK real ales as part of the JDW Real Ale Festival which runs from March 13th – 29th, with ales going on rotation in the pubs across the UK. 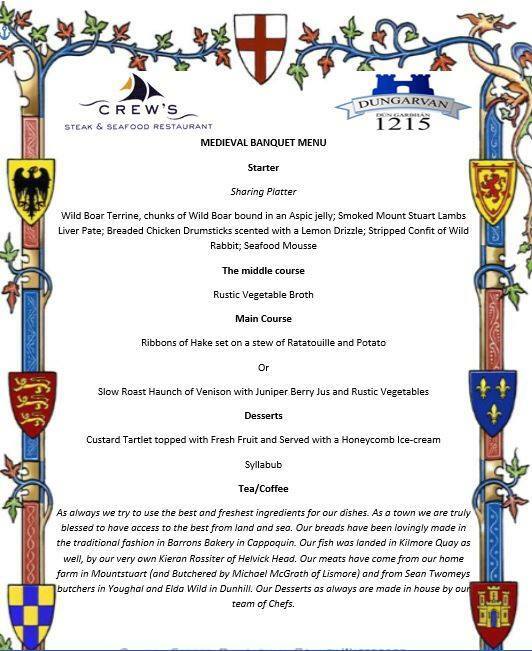 Each of the beers has been brewed using only British-grown hop varieties; a total of 24 different hop varieties are being featured amongst the festival beers, including established varieties (Fuggles and Goldings) and newer varieties (Boadicea and Jester). The overseas beers on offer have been sourced from brewers in Brazil, Canada, South Africa, New Zealand, USA, Spain, Ireland and Australia. 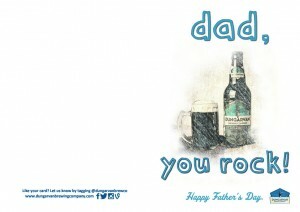 Based on Dungarvan Brewing Company’s own Black Rock, this is a smooth, full-flavoured beer brewed using roasted barley to give a chocolate taste, complemented by notes by herbal hints of vanilla and aniseed. 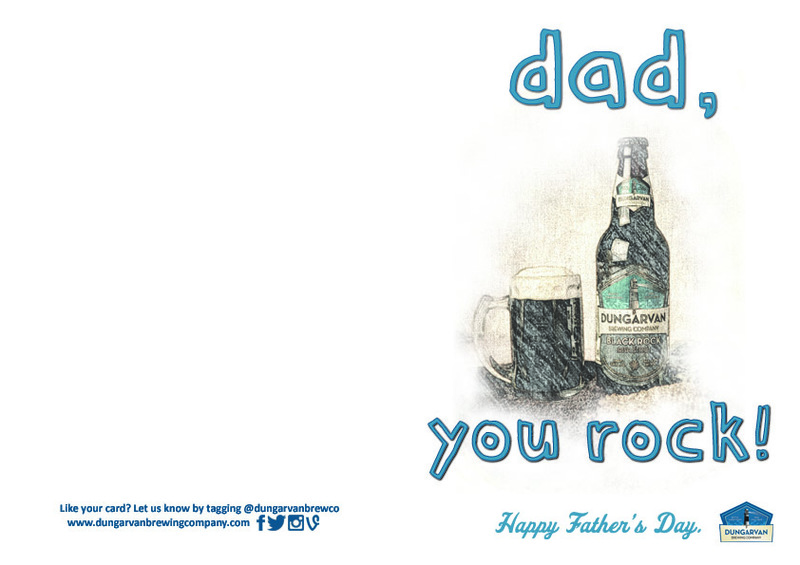 Brewed with Challenger and East Kent Goldings hops. Currently being served on rotation handpumps at JD Wetherspoon pubs across the UK, keep an eye out for it! Distilled Beer, The Spirit of West Waterford! We are delighted to have Ireland’s newest distillery, Blackwater Distillery, just a few miles from us in Cappoquin, Co. Waterford, and were especially pleased when Peter from there made contact with us with an idea he had in mind.. a distilled beer, the first of its kind in Ireland. 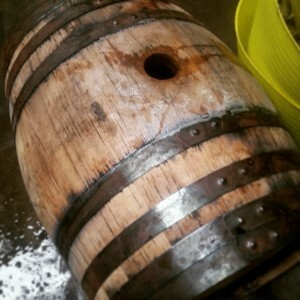 Peter wanted to explore the idea running a beer through his still and putting the resulting spirit to rest in Sherry casks for a couple of months, to take on the colouring and some of the flavouring of the casks. 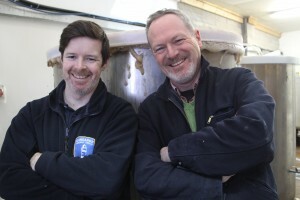 So, in January Cormac brewed up a strong (7%) oatmeal stout, which was then transferred to the Cappoquin distillery where Peter continued the operation, turning 800L of stout into under 100L of spirit. with oatmeal stout fermenting behind them. The spirit is currently maturing in the sherry casks, and it will be bottled at the beginning of April to be on sale in time for West Waterford Festival of Food, where it will be launched. There will be a very limited supply of this initial run of only 100 bottles. This is the first spirit of its kind in Ireland, which begins life as a beer rather than a wash which would be the normal process for making a whiskey. 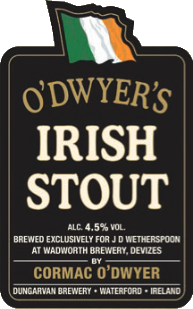 We are really looking forward to tasting the end result, especially to taste it side-by-side with the original oatmeal stout to see which of the flavours from it come through in the spirit. Details of stockists and availability of the distilled beer will be coming shortly, if you are interested in stocking it please do get in touch. 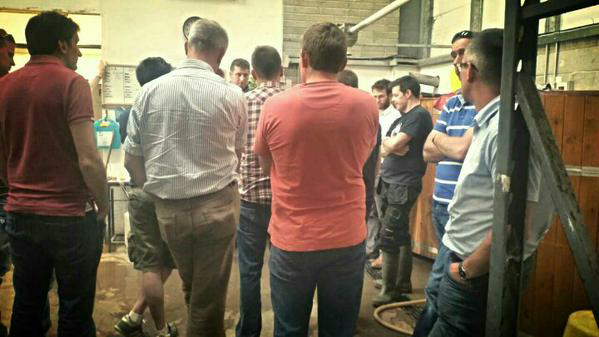 During the West Waterford Festival of Food weekend there will be opportunities to visit the brewery and distillery for tours and workshops, and you can learn more about the products we make at the Irish Craft in a Glass series over the festival weekend. 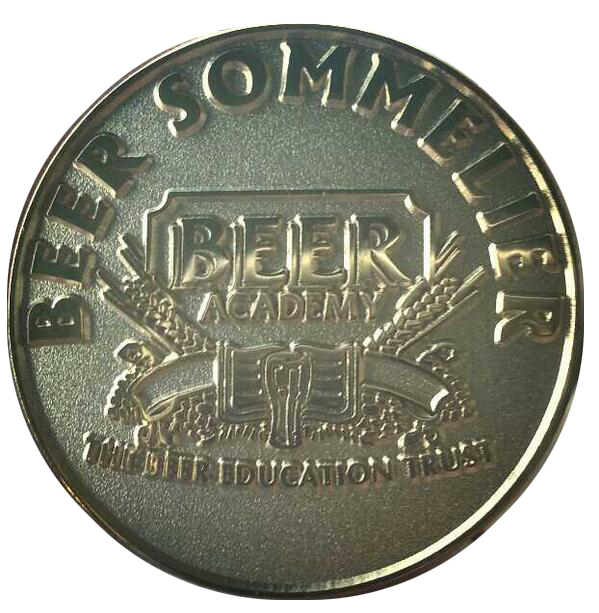 We are delighted to announce that we now have two accredited Beer Sommeliers at the brewery, with Claire and Tom both having been awarded the recognition following assessment at The Beer Academy in London last week. This brings to seven the total number of Beer Sommeliers in Ireland and both are delighted to be joining the illustrious group of Paul, Phil, Aidan, Sarah and Des. The beer sommelier scheme offers recognition of a significant depth of knowledge of beer styles and beer and food matching for successful candidates and follows on from Claire and Tom’s ongoing work in the areas of food pairings, tutored tastings and beer education and staff training. 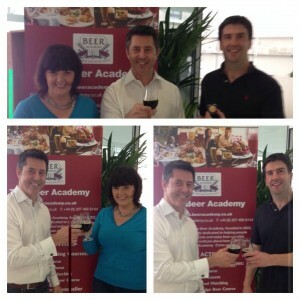 Both are also qualified beer judges through The Beer Academy and have a wide knowledge of beer styles, flavours and food pairings and have been huge ambassadors and promoters of the craft beer scene here in Ireland over the last five years. 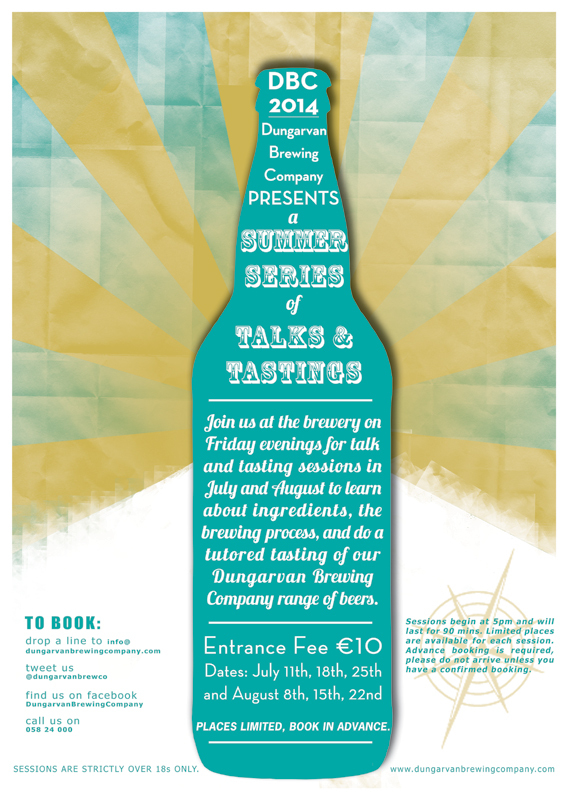 Join Claire and Tom throughout the summer as they host tours and tasting sessions at the brewery as part of our Summer Series, where you can learn more about our beers and try some samples with food matches and test their knowledge hear their thoughts on the world of beer and food pairings! 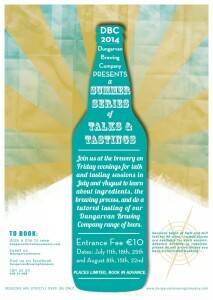 First of the series is this Friday, 11th of July at 5pm. 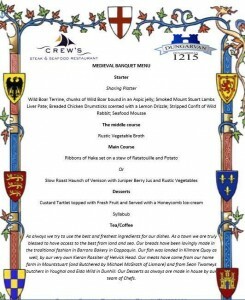 For more information or to book a place, please contact the brewery.